#MyFriendAlexa - Is Your Blog Operable For Everyone? Recently one of my readers asked me a question "why blog accessibility? ", "Is it necessary?" If you have read my previous posts on accessibility, I have mentioned that web accessibility, on a bigger view, is following a few HTML/other web technology standards in your website. However, blog accessibility is little different from web/digital accessibility. Blog accessibility is more about understanding readers out there. Every reader is different and so is his way of perceiving the content. Accessibility says to provide more than one way to perceive the blog content. Accessibility asks to follow a few guidelines while preparing content with images, multimedia and hyperlinks. And your blog comes close to become accessible. The challenge appears when bloggers assume that this is a technical work and they can't do it as they have no technical background. Most of the bloggers do not have education in HTML (HyperText Markup Language) or CSS (cascading style sheets). And some blogging platforms restrict bloggers access to the themes. So, honestly you can't make your blogging website 100% accessibility complaint. But you can bring the change with making accessible what is your biggest and the most loved contribution, the post itself. 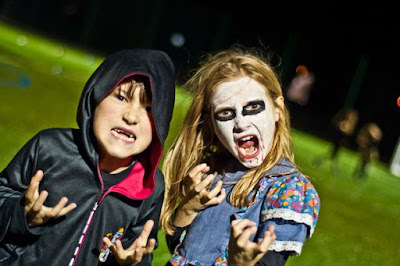 Typically the blogger alone tries his/her hands in selecting the blogging platform, the theme, plug-ins, and widgets to create the look of the blog. This is, behind the scene, a technical work only, but as blogging platforms mask that technically by providing a great user interface to customize the things, bloggers don't really feel the need of being technical. You know how to do it, so you can do it. 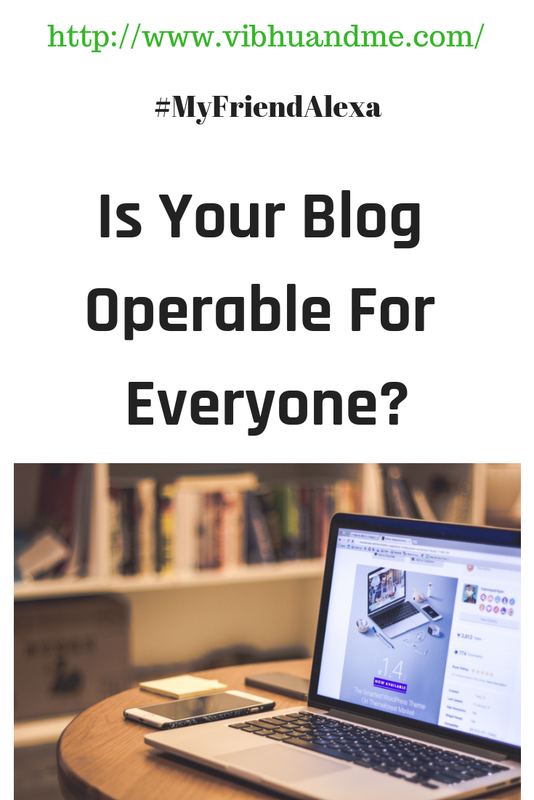 How to make your blog operable? Make sure moving, blinking, scrolling, or auto-updating information can be paused, stopped or hide. Make sure the purpose of each link is determined from the text link alone. Avoid click here or this link sort of text for hyperlinks. Make sure the link is opening the new page/post/website in the same window. Else this confuses the special users as to where the link is taking them. There is no way for them to know that the link is opening a new tab on the browser or a separate window itself. Make sure the clickable area is wide enough to mark the focus upon. Not everyone uses a mouse. Individuals may use a keyboard or an onscreen keyboard, voice input, sticks controlled by the hand, foot or head, or numerous other input methods. If the clickable area is very small, they can't click it easily. Make sure to have a correct and logical flow of focus if you have any form at your blog. Commonly tab (the key) navigation flows left to right and top to bottom. This key is heavily used to move from one box to other while filling any form. So, the tab index should be properly set. It will be good to give a "skip navigation" option on the top menu if it is full of items/subitems. Crowded landing pages confuse specially-abled users. It will be good to follow a structure for headings. The topmost heading should be the biggest one in terms of size. And the rest of the headings should clearly define subheadings and bold text. Headings are often H tags (H1, H2, H3.. ). Maintaining their order helps screen reader announce them as a heading. 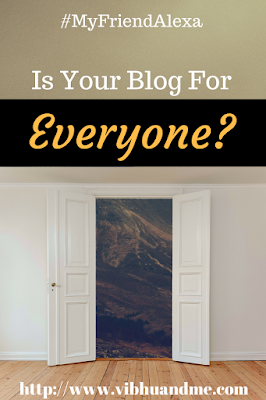 Making your blog as accessible as possible will be a process that can take time. The first step with any such process is to evaluate the existing state of your blog. And start including those small changes (alt text for images, bigger font sizes and wide clickable area etc) that yield a bigger change in the long run. Let us all help in building this digital world for Everyone.